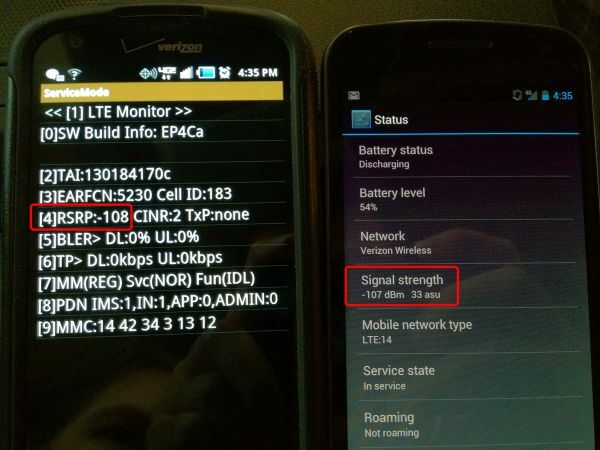 Our friends over at AnandTech did quite the investigation on the reported signal strength issue with the Galaxy Nexus. Users were reporting numerous dropped calls and a weak 4G LTE signal – I for one have only seen higher than 3 bars once. While the signal strength was lacking, I never experienced speeds anywhere close to the level of 3G and continuously averaged 16Mbps down. After investigating the issue, AnandTech has reported that there isn’t really any issue at all. In fact, the Galaxy Nexus (thanks to ICS) is reporting the accurate number of bars, where as non-ICS 4G LTE phones are showing three to four bars over their true amount. Additionally, when going to Settings > Menu > About Phone > Status on a non-ICS device the reported signal strength is actually 3G and not the 4G signal. In the image above, you can see that the Galaxy Nexus and DROID Charge have a very similar signal strength, however the Charge shows four bars of service while the Nexus is showing the accurate one-bar. All in all, you should not use the signal bars to judge your 4G LTE strength. You can sleep soundly knowing that the Galaxy Nexus features the same signal strength as all of Verizon’s 4G LTE devices. Remember, Verizon is improving their 4G LTE network each month, it is a work in progress and it will only get better.